Did you know that two identical car insurance policies, for the same driver, can vary by hundreds of dollars depending on the insurance company that sells them? This is because every insurer has a unique underwriting formula. (“Underwriting,” in short, is the equation a company plugs your personal information into to figure out how risky you are as a customer.) Each formula is going to evaluate your risk factors a little differently, and spit out a higher or lower quote depending on that analysis. The good news is, it’s easy enough to work the system when you’re looking for cheap car insurance. All it takes it a strong cup of coffee and an hour or so dedicated to checking rates from a few different providers. 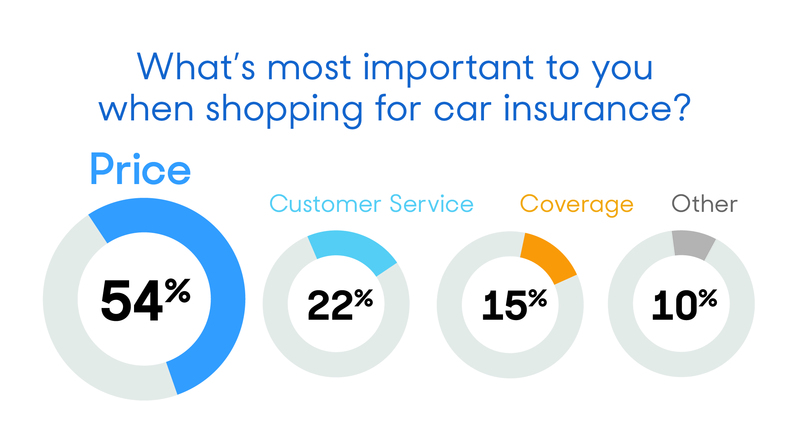 Shopping around is one of the best (and easiest) ways to save money on your car insurance. Sitting down once a year and requesting quotes from three or more providers could help you shave a few hundred dollars per year off your premium. But despite the benefits of checking rates on a regular basis, more than 40% of people say they “rarely” do it. Source: Reviews.com survey of more than 1,300 auto insurance customers in the U.S.
People who don’t compare car insurance rates often end up sticking with the same provider year after year. Out of the 1,300-plus people we surveyed, more than half hadn’t changed car insurance companies in over two years — and almost a fourth of them either didn’t remember how long it had been, or had simply never switched insurers. We don’t mean to imply that people avoid shopping for rates because they simply don’t care how much they’re paying. In fact, we asked all of our survey respondents about their biggest car insurance priorities. No surprises here: Rates came up most often. The thing is, many people are actually pretty comfortable with what they’re paying for their car insurance. Just under 50% of people say they’ve stuck around with their provider because they’re happy with their premium. Among other customers that have stayed, about 17% cite good customer service as the main reason. Then there are a few people who say they don’t have time to compare companies (7%) or don’t know where to start looking for new insurance (3%). No matter which camp you sit in (okay with your rates, happy with customer service, daunted by the prospect of finding a new insurer), we recommend checking quotes each time your policy is about to expire. You won’t end up switching insurers every year — but it’s worth looking around to make sure your current provider is still your best option. If you’re thinking “There’s no way I’m going to check rates every year,” at least note the times when it’s most important to shop around. How Long Does it Take to Check Car Insurance Quotes? Comparing insurance prices every year might sound like a hassle. But believe it or not, it only takes a few minutes to get an online quote from most providers. How do we know that? Our research team recently gathered more than 500 quotes from 10 major insurance companies, and the process for each of them averaged around 15 minutes from beginning to end. That means you could compare rates from four or more insurers (and be well on your way to finding a good deal) in under an hour. Don’t worry, asking around for car insurance quotes won’t hurt your credit score. Learn why here. It’s also worth mentioning that getting an online quote is 100% free. Coupled with the minimal time input required, that makes shopping around easily accessible to most people. Finding a car insurance policy that fits into your budget will likely be your highest priority, and for good reason. But affordability isn’t all that matters when it comes to car insurance. Ask any insurance expert and they’ll tell you that low premiums need to be balanced with good customer service, strong financial backing, and a positive claims handling record.